Years ago I had heard about someone cutting tin for the roof of a barn using a piece of wire. I could imagine this working for really thin metal, but not anything more substantial. I had a piece of 26 gauge (.022" thick) galvanized steel, so I thought I would try it myself. At first I used bailing wire and it worked, but it would break very easily. Then I tried a piece of 1/16" cable and that was even worse! At the point where the cutting takes place there is very little area under pressure from the tension in the wire, and the wire makes a sharp bend to so we need something hard enough to not get scraped up by the tearing metal, and flexible enough to bend sharply without breaking. The answer is spring steel - also known as piano wire. Not being the owner of a piano, I didn't have any spools of the special wire laying around - or an old piano I could borrow a piece from :) I did have some small coil springs though. It was just an experiment to satisfy my own curiosity. I unrolled a spring by clamping two nails in a vise and pulled the bottom end of the wire with a pair of pliers. The second nail was very close to the spring and meant as a fulcrum to bend the wire in the opposite direction it had been in in an attempt to straighten it somewhat. It worked good enough. 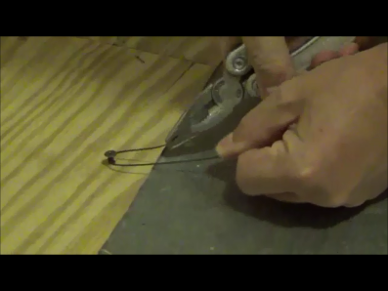 One end of the wire is anchored to the floor using a screw. 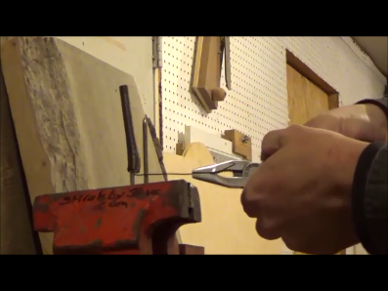 The other end is attached to a claw hammer so the wire can be rolled up around the handle as the cut proceeds. The metal to be cut will be placed on top of the wire. Standing on the sheet metal, the wire is pulled up between your feet. 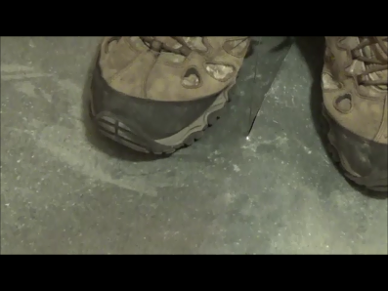 Place your feet close to the cut path to minimize deflection and improve accuracy. How much tension is needed will depend on the thickness of the metal. I am guessing that the tension needed for 26 gauge steel is perhaps 40-50 pounds. Use your legs instead of your back when pulling up the wire. I think that the maximum thickness that can be cut like this will depend on the strength of the wire, and how hard you can pull comfortably. I weigh a little less than 200 pounds, and cutting the 26 gauge was very easy for me. Don't try to cut metal with heavier wire and hundreds of pounds of tension, that seems like a good way to hurt your back if the wire breaks.